Fire Spewing Robots, And Blood Thirsty Samurai Demons Are Unleashed in What is Known As Mago-Gogo -One Night Only! 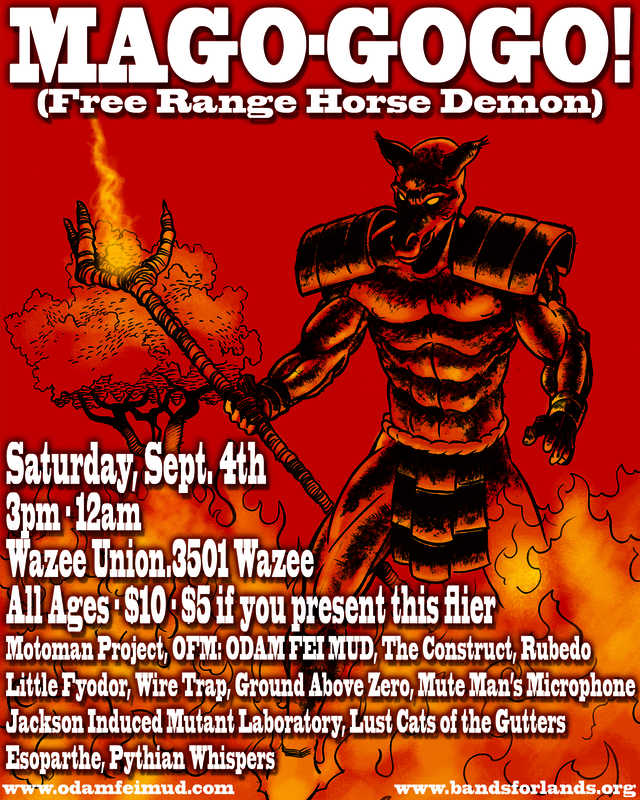 All Ages Show Benefits for Bands for Lands at Wazee Union, Sept. 4, 3pm-? Denver, CO- Experience unique performance art, live music, amazing robots and machines, props, fight choreography, and projectile fake blood in a visual and audio extravaganza certain to be a feast for the senses. 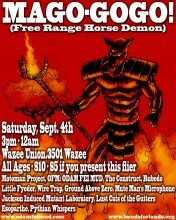 For one night only, Saturday September 4th, Wazee Union is transformed into Mago-Gogo. All of the carnage is for a good cause as the show benefits Bands For Lands’, a non-profit that is dedicated to communicating the message and practice of sustainability, conservation and social awareness issues through the mediums of music, the creative arts, inspirational speakers, educators and activists. The show will feature the machine/pyro performance art group Motoman Project that will wreak havoc with their mechanized displays of destruction. Samurai, neo-kabuki performance group, Odam Fei Mud helmed by Daniel Crosier will set forth their demons upon the earth, in their tyrannical play & sonic assault. Mago-Gogo features additional acts. This includes the avant pop maestro Little Fyodor, progressive art rock duo the Construct rocking on their vehicle that in true Hasbro style-transforms into a stage, Lust Cats of the Gutters, Ground Above Zero, Lust Cats the industrial duo Wiretrap, Esoparthe, Pythian Whispers, Rubedo, Mute Man Microphone, and Jackson Induced Mutant Laboratory. For more information please contact Daniel Crosier, 720-236-6339, or odamfeimud@yahoo.com, www.odamfeimud.com. Tickets are $5 with flyer, go to www.odamfeimud.com to print out flyers for you and friends, $10.00 day of show, all ages.